Courtney - This was an attempt to try to be proactive. And so, we developed models that allowed us to make a list of potential mosquito species that could be important transmitters of viruses like Zika for a given area – for the United States for example. As an empiricist, it’s really nice to have a list of species as well as their potential rank order of importance so that we can streamline empirical efforts to look more closely at these species and their relative importance for transmission. Chris - Michelle, how did you approach that because there are many, many different species of mosquito and they have many, many different geographies in which they can operate? So, how did you do this project? Michelle - That’s definitely correct. There's over 3,000 species of mosquitoes in the world and it would just be impossible to empirically test them all. Even to create a model that could consider all of them would be hard. So we focused on a subset of the mosquito species that transmit a certain group of viruses that are very closely related to the Zika virus. We created a model, kind of like a recommendation system that Spotify or Pandora might use to recommend a new musical artist. And so, the way these systems work is based on the traits of artist you like, their algorithms will recommend new music based on a ranking system. Our model does the same thing except in place of an artist, genre, or the rhythm of the music, we used common mosquito and virus traits such as their geographic range, or disease symptoms, or severity. This allowed us to get a list of mosquito species that could potentially transmit Zika. Chris - Now, what geographies were you considering or were you looking everywhere? Michelle - The way we use that trait was more about the presence of a species in a certain area of the world. We had a couple of different traits – one was how widespread is the species and another is if it was specifically on a certain continent. Chris - Right and you marry that with the likelihood that there is a virus a bit like Zika being circulated in that area and how much. Michelle - Yeah and then also, the presence of other mosquito species there that might carry the virus. So I was able to draw on these connections. Chris - Courtney, when you do this sort of analysis, what did you actually see? Courtney - What was produced was a list of potential mosquito species in the US that could be potential transmitters of Zika virus and other viruses similar to Zika and this was rank ordered. So obviously, we had the top two candidates were species that people would already expect like Aedes aegypti which is a yellow fever mosquito which is the primary vector for dengue and chikungunya, as well as Zika, and then Aedes albopictus which is the Asian tiger mosquito which has much wider distribution. But then there were some other candidate species that were slightly surprising. 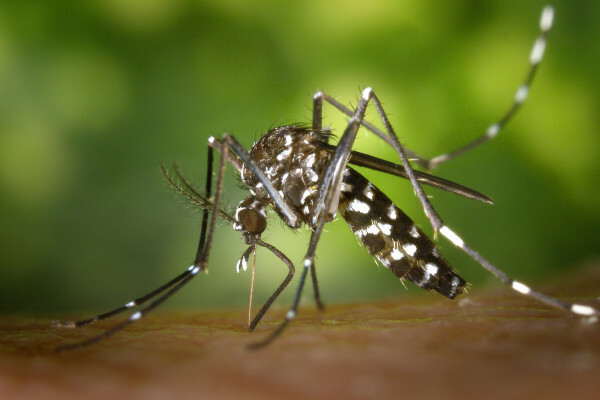 Culex quinquefasciatus: a species that does live in close proximity with humans but has been more involved in transmission of other viruses like West Nile virus – came up as a potential candidate, and we had some other Aedes species come up as potential candidates. Chris - Michelle, these data obviously are predictions as Courtney says about what mosquitoes might transmit Zika. But at the moment presumably, we don’t know. We just know that they might because they help to transmit viral relatives of Zika therefore, they might be involved. So is the next step then is to actually go and test some of the leading candidates? Michelle - Yes, that’s exactly right. In our paper, what we really strongly recommend is that this provides a list for empirical tests to be done and that as these tests are being done, existing ideas about the biological realism of these mosquitoes has also brought into to play. So for example, some mosquitoes that we predict might transmit Zika, might not really be in close proximity to humans or they might not prefer to bite humans. And so, those kinds of species can be discounted from the list relative to ones that we know are more likely to bite people. Chris - Could you Courtney, translate this to other geographies? You focused on the Americas at this stage, but would it work elsewhere? Courtney - Yes. I think our approach would work for any given geography. Chris - Michelle, bottom line of this study – if you had to summarise in one sentence and say to politicians this is what we found, what would you say? Michelle - I think the important kind of takeaway from our study is that this is a method that can be used especially in future disease outbreaks or even before these outbreaks happen to help get researchers on the right track as far as which species they should be considering or even vaccine development: which are the viruses we should be targeting? And it just helps us prioritise where to spend our limited time and resources. Next Why should we fund research on neglected tropical diseases?